After my soulful sojourns in the North-eastern and Garhwal Himalayas, I descended to Mumbai for some personal work. Three weeks of sweltering heat has left me craving the rains, and made me nostalgic of my monsoon adventures last year, when I chased the rains from Rajasthan to Hampi. A nomadic life was once a common lifestyle choice in India. We were gypsies, travelled without possessions, smoked up, made merry, set up a home in whatever place caught our fancy, and lived the best life we knew. Today, the gypsy aka Banjara community can only be found in some pockets in India. The district of Sandur, over an hour’s drive from Hampi along majestic landscapes in the Western Ghats, is one of them. Many traditional gypsy women in these parts have traded their nomadic life for a steady income, using their masterful “banjara embroidery” skills at Kushala Kala Kendra, set up by the once king of Sandur to empower the local community of craftswomen. Browsing through their finished clothes, I realized I had bought some of them at Fab India. The world works in mysterious ways! 2) Stay in a 4th century heritage house. Built in traditional materials and architecture, Uramma Heritage Homes in Anegundi. As much as I was overawed by the magnificent ruins of Hampi (Also see: In Photos: Life in Hampi, Karnataka), I loved taking the coracle boat across the Tungabhadra river to my home in the village of Anegundi. Though only across the river from Hampi, Anegundi feels like a different world. Largely devoid of tourists, it offers a glimpse into life in these parts; the locals work and live amid the majestic boulder-strewn landscapes and earn a living by farming. On my first trip, I ditched the backpacker-style accommodations of Hampi to stay in a guesthouse (the base category of Uramma Heritage Homes) run by the village community. Designed by a French architect, my room was beautifully minimalistic. If you can afford it, the heritage houses and the Machan are well worth an upgrade! Place Hampi exhibit in Vidyanagar. Photo by Hyatt Place Hampi. On my first trip, I lost myself amid the ruins of Hampi, travelling back in time to discover the architecture and traditions of the glorious Vijaynagara empire. But it was only on my second trip that the magnitude of this ancient civilization sunk in. The “Place Hampi” museum exhibit is nothing like a museum; you put on 3D glasses and virtually maneuver your way through the ruins of Hampi, stopping along to notice things you never would otherwise. This masterpiece was created by two Australian historians who spent years studying and documenting the ruins. When the Jindal family stumbled upon their work at a museum in Melbourne, they decided to replicate it closer to home, at the steel township of Vidyanagar, in a visionary art and cultural centre called Kaladham. I’m not a museum-person, but this rediscovery of Hampi left me awestruck. The architectural brilliance of Badami. The 8th century temples and caves in these villages are major attractions, but it was the landscapes and slow-paced life in these parts that really fascinated me. Dramatic boulders and ruins of ancient temples are scattered across the villages of Aihole and Pattadakal, and locals have built their lives, and homes, around these. Badami, on the hand, appears to be a white town with a golden-domed mosque from the peak of its rock cut temple cluster. The 4-hour drive from Hampi is littered with gorgeous sunflower fields and a lush countryside. 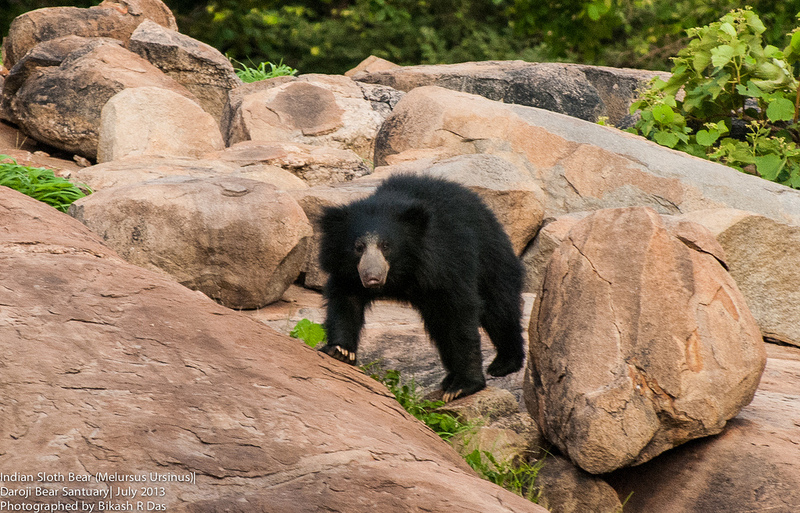 Sloth bear sighting at Daroji. Photo by Bikash Das. I didn’t have time to experience this myself, but it’s on my list if I ever go back. I heard from the locals that the sanctuary area was once a scorched barren land. The sanctuary officials and the village folk have worked hard to transform it into a blooming forest of wild fruit trees (to attract bears) and edible fruit orchards. For that alone, the sanctuary sounds like a worthwhile trip! In the summer, when the wild fruit trees are in bloom, sightings of sloth bears and animals like porcupines and jackals from an aerial lookout are a high possibility. During the rains, the sanctuary is filled with migratory birds and colorful wild flowers. Traditional sunken seating at Hyatt Place Hampi. While planning my second trip to the region, I was surprised to learn that away from the predominantly backpacker and budget accommodation options around Hampi, Hyatt had created the boutique Hyatt Place hotel for those seeking more creature comforts. Quietly nestled in the manmade township of Vidyanagar, Hyatt Place started out to cater to business travellers visiting the nearby steel plant. But as someone who wanted to be close to Hampi and yet far enough from its hustle bustle, it turned out to be a great alternative for me. I spent my mornings cycling around the scenic township, with the Western Ghats in the backdrop, and my evenings in Hyatt’s colorful lounge with bean bags and Wifi. I missed regional food in their largely continental / north Indian menu, but travelling by myself, had fun hanging out with the staff from different parts of the country. It is conveniently located for visiting Hampi, Badami, Sandur and Daroji. Cycling around the manmade township of Vidyanagar. What undiscovered experiences near Hampi would you add? Nice post! Ive been to Hampi in 2008, but have’nt done these experiences apart from Badami. Excited to plan my next trip to this magical place. Your account on the gypsy or the banjara women remains the highlight of your blog for me. There is nothing like revisiting our history through dwindling communities ! wonderful girl! keep traveling! I agree Myra. It was one of the highlights of my trip too. Comes about just the right time, as I am visiting Badami-Hampi this month. Thanks ! That’s awesome, Deep! Hope you get to check some of these experiences out. I have been to Hampi once and ever since have wanted to go back. Thanks for sharing this list – most of these I had never heard off, and would love to now explore. I’m glad you have new reasons to visit it again, Chaitali! Coracle ride on tungabhadra river, renting a 2 wheeler and roaming around the nearby sugarcane fields behind the setting sun, having a dinner hearing to the waves if tungsbhadra in the mango tree restaurant, observing how the little kids speak english with foreign accent and mingle confidently with the foreign tourists ! Agree with all of them Chandrima. Thanks for sharing them! Nice post. thanks for sharing some of the information related to Indian tribes and Like Banjara. because of its esteemed reputation as well as its style. perfect and consistent coffee each and every time. It includes a filter system that could be the same because conventional espresso machines. I am looking forward to go to Hampi in the first week of September as a solo traveler. This would be my first time and I have been confused between Munnar and Hampi but I don’t know why this place has been attracting me a little more for some weird reasons. Just needed to know how safe it is. I’ll be there just for two days and I want to make the best of the time I spend there. I envy you girl 😉 (and then I also know that it does get difficult at times to work these things out and to collect enough money and all). Keep going! Previous PostSikkim: The Lost Kingdom. Next PostKinnaur: Of Mountain Legends, Unknown Trails and Wild Beauty.